I am looking forward to a day of peach picking with the fiancé, and maybe a special dinner out, if we have not melted by then. You can follow the adventures on SnapChat (pedanticfoodie), because yes, I finally joined. I figured it out just before Instagram went and made it’s own version. Thanks for that. I’m not even touching the Instragram thing yet because I am still trying to train myself to talk in my normal voice on SnapChat. As soon as I hit record I go into perpetual whisper mode. Why??? I’m working on it. Follow at your own risk. But please, do follow, I need people to tell me all the things I am doing wrong. This pie is really just a way to shove everything I want to eat at 2pm into my mouth. It looks like the most ridiculously indulgent thing I have ever posted, and it just might be. Let’s talk about this crust. I’ve never said this about anything else, but I actually prefer gluten-free pretzels over the regular ole’ gluten-filled variety. I know it’s just because they are SO CRUNCHY and we all know I’m all about texture. My favorite cereal is Oh's and I am sure that’s partly because it is one of the crunchiest things in the world. But, I digress… The only thing I like more than texture is a good cereal-related tangent. Gluten-free pretzels, with all their crunchy power, stand up great to the wonderful mess we are going to cover them with. This crust causes a little bit of anxiety in the heart of its maker. In fact, the day after I made this pie I was just about to remake crust entirely because several hour after making it, it looked like a crumbly mess. However, when I cut into this pie the second time, the crust held together like a dream. Know from the start that it is going to look too crumbly, but with a little patience, it will hold together in the end. The secret is letting the pie set long enough to allow the butter in the crust to solidify. Because we pour warm custard over this crust, that's going to take a bit, but it's worth it. Of course, we could add more butter to begin with, but this crust is so wonderfully crunchy and the more moisture added, the less crunch we will achieve in the end. This salty-sweet crust is covered with a layer of ripe bananas before we cover it with thick vanilla custard. The custard needs several hours in the refrigerator to set, then we can cover it with another layer of bananas and rich, chocolate ganache. After the ganache shower, comes the chilling. This pie really needs to sit overnight. That will give the flavors a chance to meld, and the custard the time it needs to really set up to a sliceable state. The last step you will want to do just before serving, so that the marshmallows are still warm and gooey. 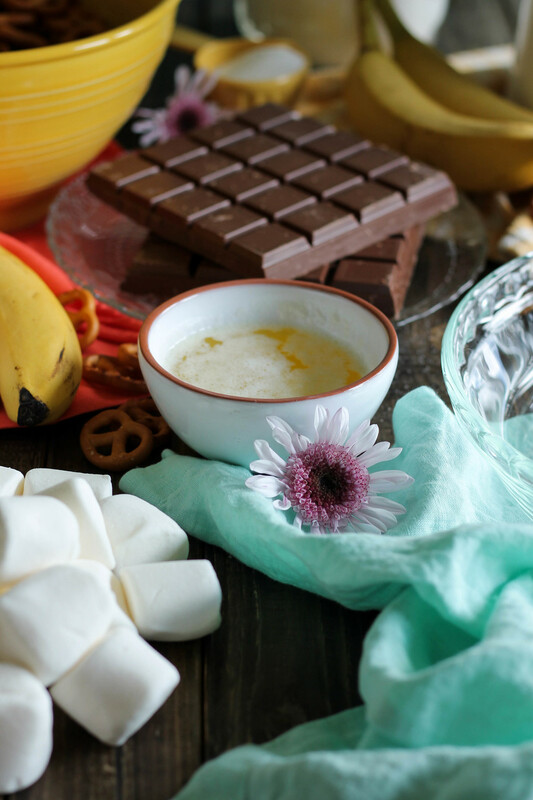 Cover the surface of your pie with marshmallows. Homemade would be best of course, but if you feel the need to cheat like I did, it's okay. Using a propane torch, toast the marshmallows evenly until they are soft and slightly charred. Those black spots are going to give us that campfire flavor we all adore. I decorated the surface of my pie with some dipped pretzels, just because there's always room for more salty-sweet magic in my kitchen. Place pretzels in the work bowl of your food processor and pulse to form rough crumbs. Mix in granulated sugar and melted butter and pulse until the mixture begins to pull away from the sides of the bowl and come together in a rough mass. If the crust is still looking too crumbly, add an additional 1-2 tablespoons of melted butter to just bring it together. Press the pretzel mixture into a glass pie plate, working out from the center and moving the mixture up the sides. Bake for 10 minutes or until deep golden and fragrant. In a medium bowl, combine egg yolks and sugar. Whisk for 2-3 minutes, or until the yolks have thickened and lightened in color. Whisk in cornstarch. Pour milk into a heavy-bottomed, 2-quart saucepan and place over medium heat. Heat to 200 degrees, or until the milk is steaming and has just reached a simmer. Remove from heat and slowly stream 1/2 of the milk into the egg yolk mixture; whisking constantly. Pour the egg yolk mixture into the saucepan and return to heat. Cook over medium heat, whisking constantly, until the mixture has started to boil and has thickened to a pudding-like consistency; about 3 minutes. Remove from heat and strain through a fine mesh strainer. Stir in butter and vanilla extract. Slice two bananas and arrange the coins out on the bottom of the pie crust. Cover with custard. Press plastic wrap over the surface of the pie and refrigerate for 3-4 hours, until cool. Slice the remaining banana into coins and place over the surface of the chilled custard. Combine milk chocolate and whipping cream in a small, glass bowl. Microwave at 20 second increments, stirring after each, until smooth and melted. Dip pretzels in a small amount of ganache and lay them out on a sheet of parchment paper to set. Pour the ganache over the surface of the pie. Cover with plastic and refrigerate overnight. This will help the custard to fully set. Just before serving, cover the surface of the pie with marshmallows and toast with a kitchen torch. Decorate the surface with dipped pretzels. Serve immediately. Enjoy! !